Feel the need to escape? 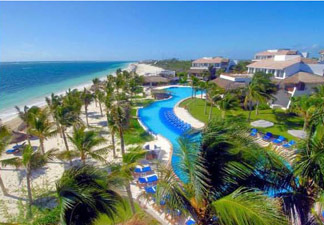 Imagine yourself at the luxurious 88-room boutique hotel Ceiba del Mar Beach & Spa Resort in Puerto Morelos located in the Riviera Maya, Mexico where every room has an ocean view, and a long stretch of white, soft, sandy beach to stroll. 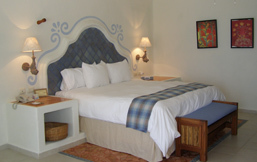 Staying at Ceiba del Mar Beach & Spa Resort in May 2008, we experienced Mexican hospitality that began at the reception where Edward F. Nesta and I were welcomed with a refreshing drink and a cool scented towel. Unlike larger hotels in the Riviera Maya, Ceiba del Mar Beach & Spa Resort (49 suites, 32 deluxe rooms, 7 penthouses) has a decidedly residential feel, excellent restaurants, and a Spa to pamper you with Mayan treatments. 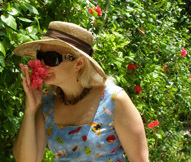 Strolling past the koi pond with fountain, and through the immaculately kept gardens laden with cactus, as well as hibiscus and bougainvillea in riotous colors that dazzled the eyes with their beauty, I felt like I was at home, rather than staying at a hotel. Although it is a small hotel, it is large on amenities with two main restaurants, Arrecife Grill & Lounge, open for lunch and dinner, and Xtabay Restaurant, open for breakfast and dinner, where we thoroughly enjoyed our dining experiences at both of the restaurants. We had a delicious lunch at Arrecife Grill & Lounge where we sat outside on the veranda under a thatched roof and were cooled by ceiling fans. Stunning views of the beach and the sound of the waves lapping the shore, provided the perfect accompaniment to our lunch of grilled Argentine chorizo, and Ensalada Mexicano with nopales and queso panela (Mexican salad of prickly pear cactus pads and cheese) in arbol chile vinaigrette. In the evening, we had a wonderful dinner at Xtabay Restaurant where Executive Chef Santiago Kantun has an innovative Mexican menu with Mayan elements, including Salpicón de pulpo bebe, sobre carpaccio de piña, aros de cebolla morada, salsa BBQ al chipotle (Baby octopus on a pineapple carpaccio, marinated purple onion, BBQ sauce and chipotle pepper); and Poc chuc, solomillo de cerdo marinado con salsa de achiote y pure de frijol (Typical Yucatan food, pork tenderloin marinated with achiote sauce and mashed black beans). 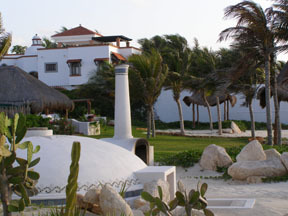 In addition to the two restaurants, there are three bars, the Terrace Lounge, which features sushi and ceviche in the evening as well as cocktails with an incomparable view from the top where comfortable chaises await, Bar de Tequila where there is an excellent selections of tequilas for aficionados, and the Pool Bar where we swam up to the bar stools and enjoyed the ambience. 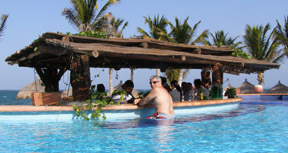 The hotel has two swimming pools, which overlook the sandy beach, and one of the pools has chaises in the water where guests can keep cool while sunbathing, a feature that I especially liked, and there is a large Jacuzzi located on the side of the pool bar. For more ambitious guests who want to do more than just swim in the pools or the ocean, or relax on the lounges on the beach in the shade of a palapa with a Margarita and a good book, although that is always lovely, there is snorkeling equipment and kayaks available, and a Padi Dive Center on the premises that offers guests the opportunity to experience an introductory scuba dive in the pool. The Dive Center has a boat moored just off the pier to take scuba divers and snorkelers on outings, which is the ultimate in convenience. There is even a Library lined with glass cases with a large selection of books that guests can borrow, and there are two computers and a printer, which we used each morning to check our email. The hotel has a Fitness Center, Yoga, Pilates, and Aquafit classes, and also has bicycles for guests to take a ride to discover the sleepy town of Puerto Morelos, although we opted for relaxation whenever we could at the hotel, by strolling down the beach, sitting on the pier and watching small fish swim by, reading under the shade of a palapa, and relaxing on our terrace in the Jacuzzi or the hammock. Ceiba del Mar is where you come to relax, to appreciate the stunning myriad of colors of the ocean, listen to the melodic and ever-changing music of the waves, watch the mesmerizing palm trees swaying like dancers in the breeze, and visit the Spa when you are looking for total pampering. 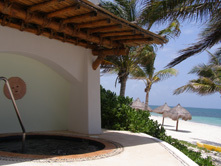 The Spa at Ceiba del Mar takes a holistic approach and offers guests the opportunity to have a truly Mayan experience including a Temazcal, and treatments incorporating Mexican herbs, organic Aloe vera, and honey from bees from the Yucatan peninsula. We thoroughly enjoyed our Spa treatments, and with the diversity of the treatment menu, we wished that we had a few more days to experience more of them. Talk about a room with a view; we entered the door to our suite and from the large windows, could see the ocean and the beach lined with palapas that looked like drinks umbrellas popping out of the sand, and coconut-laden palm trees swaying in the warm breeze. The room featured two walls of views framed by sheer white treatments, a large picture window, and two glass sliding doors in the sitting area that led to a bi-level terrace where there were two white wrought iron chairs flanking a glass table, and a dreamy hammock on the upper level. Walking down a few steps, there was a private Jacuzzi and a double lounge chaise on the lower level, and walking a few more steps, we were on the beach. When we could tear ourselves away from the outside living area, we returned to discover the rest of the suite. The spacious room featured a headboard made of molded white stucco and blue tiles, built-in stucco nightstands on either side of the bed, and fish-motif sconces with ivory shades. The king bed was dressed with a pristine white duvet with a soft blue throw with a pattern that echoed the tiles of the headboard, a wood bench with blue cushion was placed at the end of the bed, and an iPod ready radio on the nightstand along with a selection of magazines. On the opposite wall, there was an armoire with television, and a desk/vanity area with large mirror and wood stool with a cornflower blue cushion. 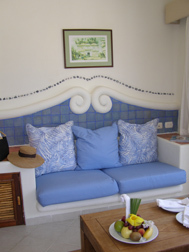 In the sitting area, there was built-in seating, which featured a whimsical curlicue design of stucco and blue tiles with plump cornflower blue and white cushions and decorative pillows. Two leather and bamboo round chairs with blue cushions flanked a rectangular wood table bearing a coffee table book, and an inviting white plate of exotic fruit accessorized with a yellow hibiscus flower, papery white bougainvillea, and a palm fan. The hotel has many innovative ideas, one of which is the mini-bar, which is empty with the exception of water, and will be filled according to your preference by calling the room butler. The bathroom featured a large wood mirror in the shape of a flower over the vanity, a walk-in tiled shower, separate soaking tub, and enclosed toilet. Besides slippers, a hairdryer, scale, vanity mirror, and a variety of amenities, they had thoughtfully included aloe vera, so soothing after spending too much time in the sun, and pump-spray insect repellant perfect for visiting adventure sights. In place of the usual belted terry robes that one usually finds, the hotel has waffle weave white pull-on gowns. For breakfast, guests may select to dine at Xtabay Restaurant or have a complimentary continental breakfast delivered to their room, which is what we selected. There is a small door outside the guestrooms that opens onto a shelf inside the closet for the room butler to leave breakfast at the requested time without disturbing the guests. 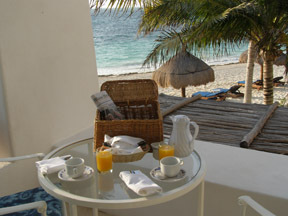 We loved waking up, opening the door, and finding our wicker basket filled with a thermos of steaming hot coffee, orange juice, and a selection of rolls and pastries, which we promptly took out to the terrace to enjoy while reading the newspaper. 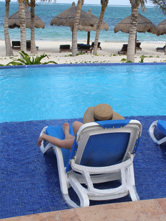 Whether you want to relax, experience Spa treatments, or discover all that the Riviera Maya has to explore, Ceiba del Mar Beach & Spa Resort is a delightful hotel. Please read other articles on Ceiba del Mar Beach & Spa Resort in the Destinations, Restaurants, Spas, and Chefs' Recipes sections where Chef Santiago Kantun shares his tempting recipes. 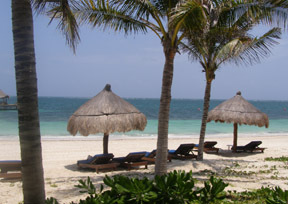 Please read other articles on Riviera Maya in the Destinations, Spas, Restaurants, Chefs' Recipes, and Adventures sections.